“Spies” begins in the year 1957 and we see Soviet spy Rudolf Abel (Mark Rylance) getting arrested. James B Donovan (Tom Hanks) a successful Insurance Lawyer is given the task of defending Abel, a task that comes with a share of risks. Donovan ultimately takes up the task and prepares to give the man a fair defense in court. A this goes on another situation plays out as a fighter pilot named Gary Powers gets his plane shot down in Soviet territory and gets sent to prison in Russia at the same time a young student learning economics in the Soviet section of Berlin is also thrown in Jail. The American government and Soviets realize they have prisoners that belong to their respective countries and so Donovan goes from lawyer to negotiator as well and must find a way to appease tensions and successfully make the needed swap of men. The film was too long or at least felt to long. It had a reeeeally slow pace. The dialogue in script was pretty good. Story itself could have been slightly structured better and they could have cut down on some parts. Some scenes desperately needed music a score of some kind! 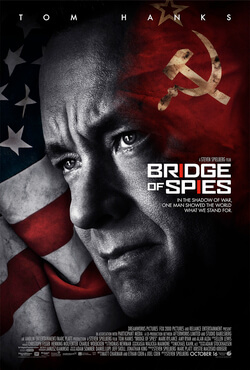 Tom hanks was very good here. He really did a good job in playing this guy with a patriotic and moral conscious and wants to see fairness no matter the situation. Mark Rylance was frustrating for me because I didn’t like how much his accent jump around in the film he was putting on an English accent, a Russian a German it was annoying. The rest of his character development was ok. we didn’t really care for Gary Powers in here. Amy Ryan, Alan Alda and the rest of the cast did a decent job. Steven Spielberg utilized some elements from previous films like Munich but its ok I mean sometimes you do that but he was able to emphasize the patriotism. This was the most obvious case or look that the film was a dramatization i have ever seen..Just wanted to point that out. So Basically not a film that you would want to look back on or go see again in a theater after watching it the first time. 3 star flick for sure wouldn’t rate it any higher.